The Good Hope Lions Club made a donation to the FCMH Foundation recently. The donation is part of the proceeds from the club’s annual Candy Store sales and the semi-annual pancake sausage suppers. Pictured from left are FCMH Foundation members, Bill Junk, Norma Kirby, Rob Herron, Andrew Daniels (also representing the Good Hope Lions), Shannon Jacobs, Roger Kirkpatrick, Gary Butts and FCMH CEO Mike Diener. 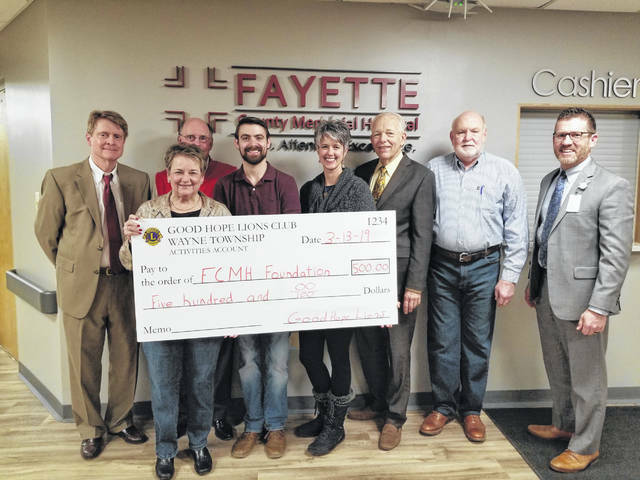 https://www.recordherald.com/wp-content/uploads/sites/27/2019/04/web1_412019-GOOD-HOPE-LIONS-DONATE-TO-FOUNDATION.jpgThe Good Hope Lions Club made a donation to the FCMH Foundation recently. The donation is part of the proceeds from the club’s annual Candy Store sales and the semi-annual pancake sausage suppers. Pictured from left are FCMH Foundation members, Bill Junk, Norma Kirby, Rob Herron, Andrew Daniels (also representing the Good Hope Lions), Shannon Jacobs, Roger Kirkpatrick, Gary Butts and FCMH CEO Mike Diener.